Who is Considered a Distance Student? take a combination of online classes, classes at WCU in Philadelphia, classes at the Graduate Center, classes at the Exton campus, and classes at the DCCC campus. Non-distance students may find the information in this guide useful for accessing resources while off-campus, but they will not be able to request books be mailed to their home. If we don't have it online, you can request it be sent to you. You can also request items WCU doesn't own. Textbook We are unable to get textbooks for current WCU courses through ILL; more info on your options. DVD Distance Student Book/DVD Request Form; we only ship DVDs that WCU owns. Book Chapter ILLiad, please include both the book title and either the chapter title or page numbers of the chapter. Please request one chapter at a time. Go to the ILLiad login page. Select the First Time Users link. The First Time User Registration for Interlibrary Loan page provides information about your ILLiad account. After reading, select the First Time Users Click Here button at the bottom of the page. The New User Registration for ILLiad page appears. You must provide information for those fields marked with a red asterisk. 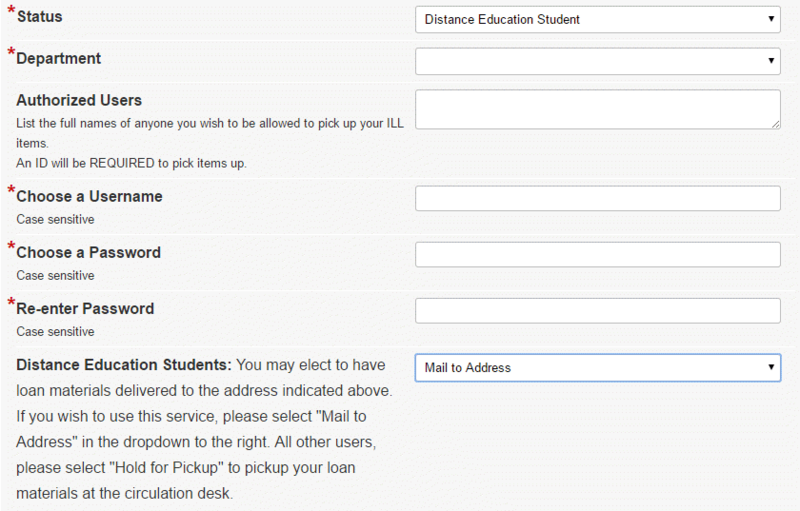 When you get to the Status field, enter Distance Education Student as your Status. Your Username and Password do not have to match your WCU username and password. Once you are logged in to ILLiad, you will see the Place New Request and View Request menus on the left. If you have questions about your ILLiad account, check with the Interlibrary Loan department at illoan@wcupa.edu or 610-436-3454.